Jaguar has tried to address the issue of a lack of lie-flat baby makin' room in the back of the XF sedan, officially revealing its new station wagon, the Sportbrake, a week before its debut at the Geneva Motor Show. That said, it's likely that only a pretty short couple could really get comfortable in the rear of this longroof, as the Sportbrake is only 5mm longer than the XF sedan but provides nearly two more inches of rear headroom. To accomplish this, the Sportbrake puts on about 150 pounds and gets "extensive changes to the rear suspension." We're going to have to wait for one to come stateside to find out how it feels on the road. That's where the story gets murky, as a Jaguar Land Rover North America spokesman told Inside Line that the Sportbrake is not federalized for sale in the US. Which is sad. Because America needs more wagons — even if Americans themselves aren't demanding them. Or buying them. Or talking about them. Or, you know, thinking remotely about them. We've already explained why Jaguar should bring the Sportbrake here. If they've been teasing us with shots since November and they decide not to bring over the second Jaguar wagon in 90 years, we're going to kill a kitten. 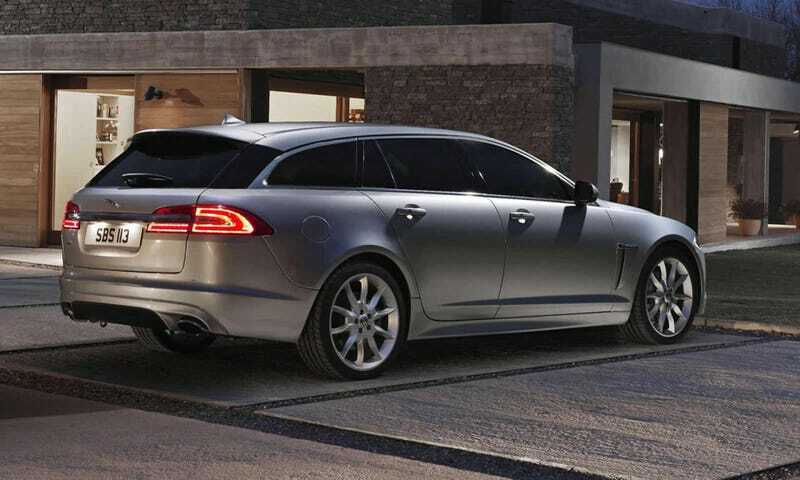 We'd burn an animal shelter to the ground if they make an XFR wagon and keep it out of America. Don't make us do it, Jaguar. The X-type estate never sated our hunger for wood- and leather-lined British wagons. If we don't get our fill, we're liable to do something we'll all regret.